Paul Kroone went on to say “It is great when things come together. He’s right about that. This new member went into action mode right away, and we're not surprised at all that things started coming together for him. The dude's a go-getter! You can find that in the back-office of MLSP right now! Awesome stuff Paul. 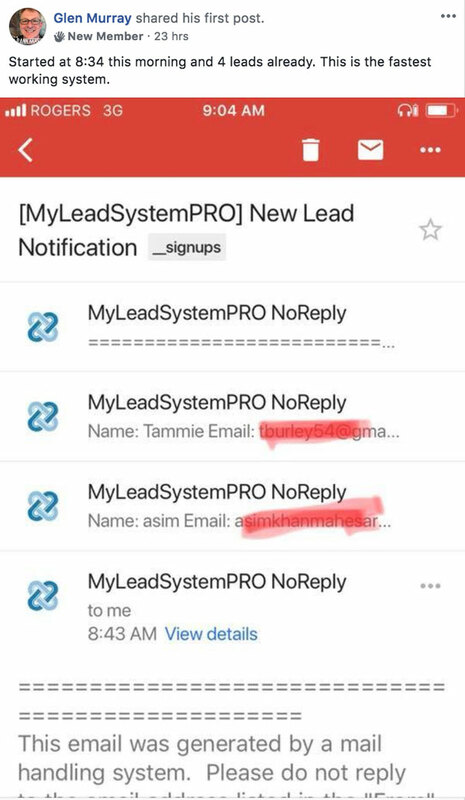 Many more leads to come! 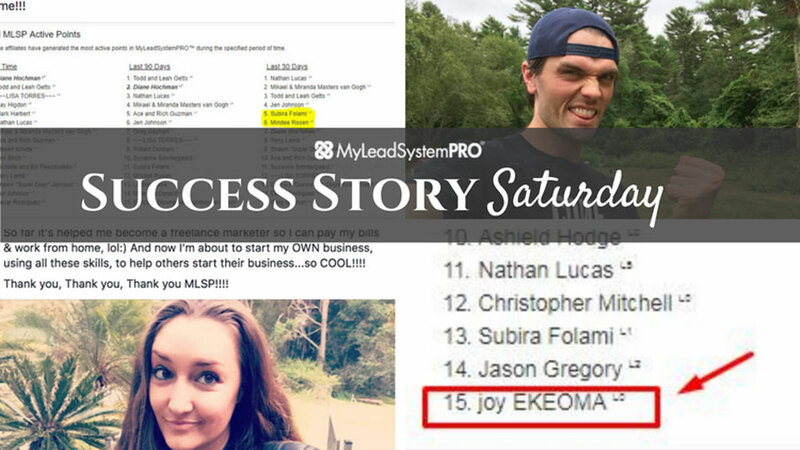 Looks like JoAnna Sagrero is another new member who's not wasting any time getting started and taking action. 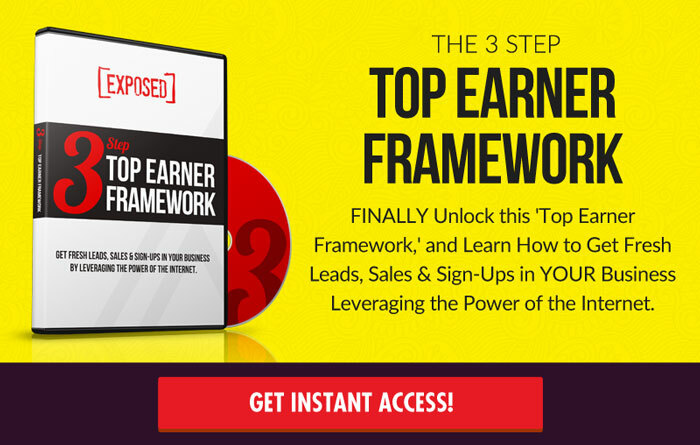 She’s grabbing up leads on Instagram already, and she's not even through the training yet. Another who hasn't even completed the “Start Here” training in the MLSP back-office. Tina's killing it, and is barely getting going. BOOM! BOOM! Glen Murray is a brand new member and is already killing it. 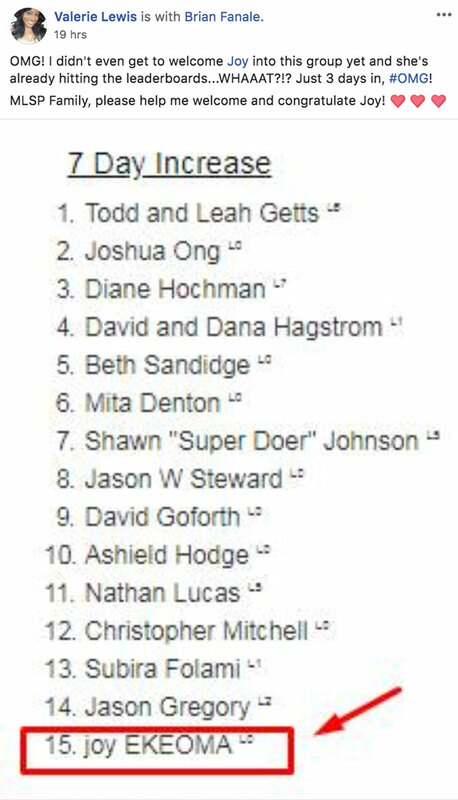 Four leads on the first day isn't typical, but we have been seeing a lot of newcomers smashing it out of the park in short time. Well Joy Ekeoma didn't wait around at all to be introduced to the MLSP private community. 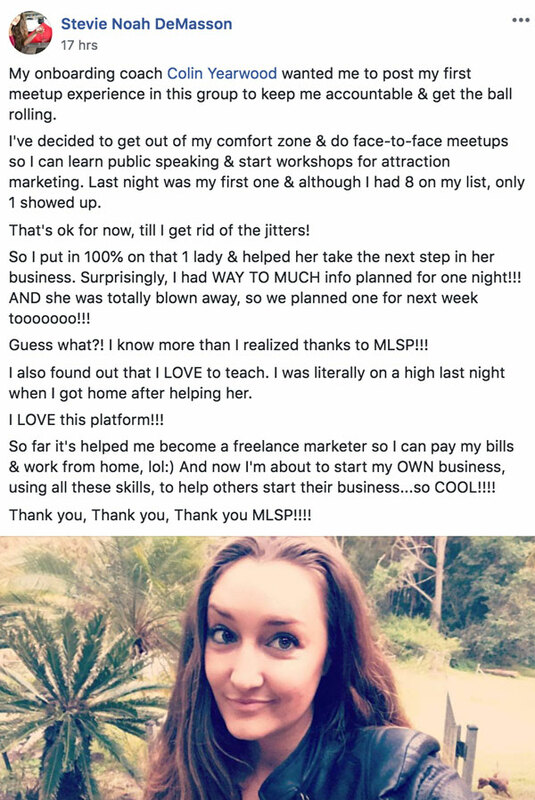 She just immediately started taking action and getting results. Way to go after it Joy!! 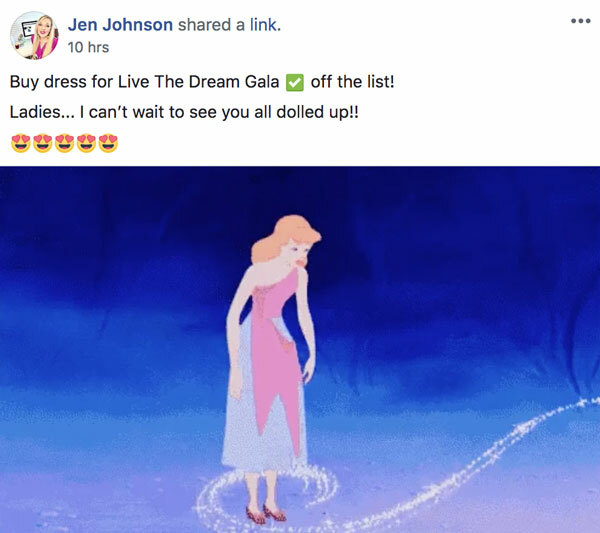 Jen Johnson is ready to go and dance the night away at the Live the Dream Gala in just a couple of weeks. She’s got her gown and ready for the ball. It's gonna be huge, and Jen and Baxter the Badger will be cutting the rug! Can't wait to see ya there Jen! Angie Frontera is ready for her breakthrough. She's on the edge, she can feel it, and so can we! Why? Because she's making moves. Doing the things that create breakthroughs. They don't just come, you have to create the opportunity for them to come, and that's exactly what Angie has been doing. No matter what you do today, you'll want to take 2 minutes and read her entire post below. It's touching, and it's true feelings of someone who's doing what it takes in real time. The “all this” part is what you'll want to read below. But most importantly Angie is expecting her breakthrough at LTD9, and that's half the battle won!! Stevie Noah DeMasson is learning some awesome things about herself this week, and we're lucky to have her share them in our amazing community. BOOM! When you care more about others success than your own, great things start to happen. Other people start to realize your awesome value, and so do YOU!! BOOM! Way to go Stevie!! Lisa Thompson is killing it once again. The awesome thing is that she took a negative (getting diagnosed with Type 2 diabetes a year ago) and turned it into a positive as she's been helping other people through their diabetes struggles. 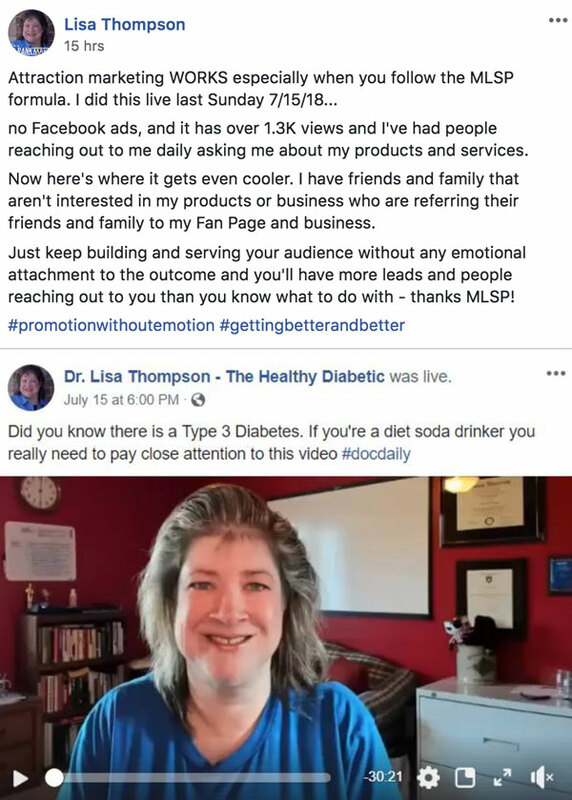 And how she's using attraction marketing and Diabetes to do exactly that. She's now built an audience of engaged people where she can do a LIVE, get 1.3K views, and change other's lives and her own. “Now here's where it gets even cooler. I have friends and family that aren't interested in my products or business who are referring their friends and family to my Fan Page and business. 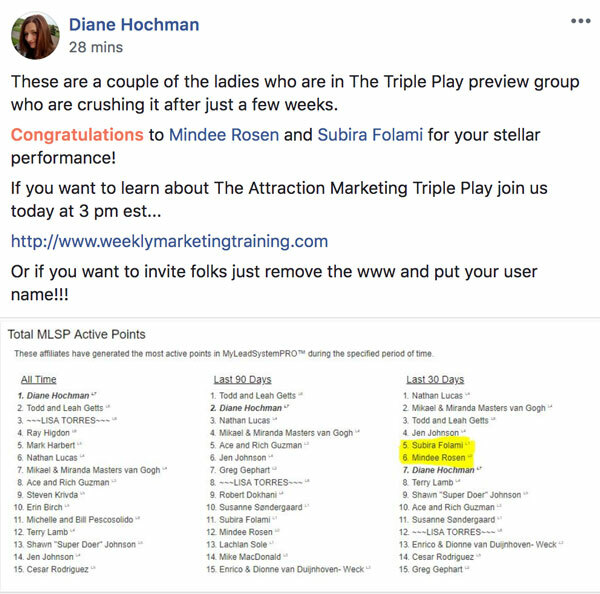 Diane Hochman's been on fire this past few weeks, and so are the people who are following her ‘Attraction Marketing Triple Play’ training! 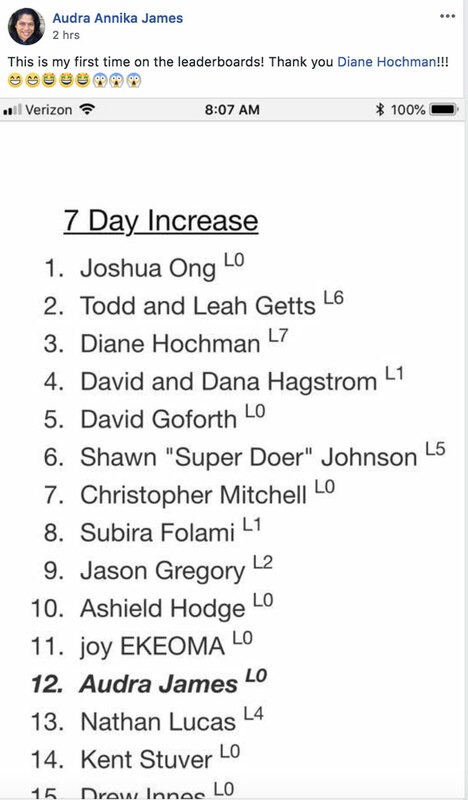 Mindee Rosen and Subria Folami popped up on the leaderboards after just a few weeks. 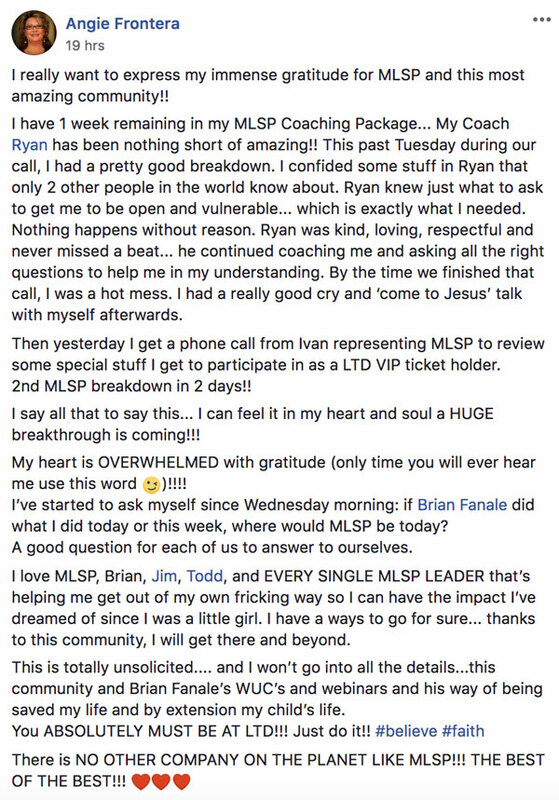 Ricky Borrows is seeing things more clearly now because of his first MLSP coaching call! 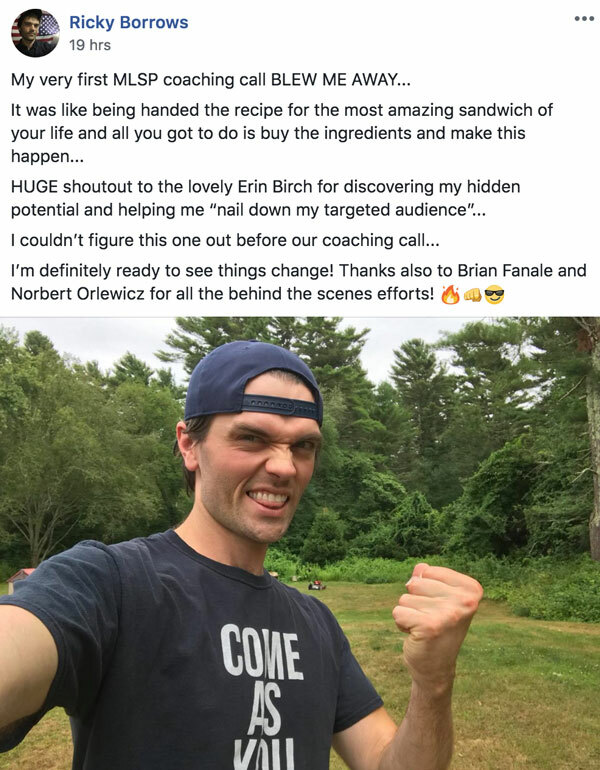 “It was like being handed the recipe for the most amazing sandwich of your life, and all you’ve got to do is buy the ingredients and make this happen. So looks like Ricky is about to make himself a big ole success sandwich! Audra Annika James just found herself on the leaderboards this week. Great work Audra. Keep it up!